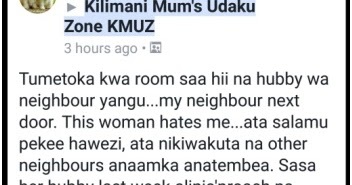 Home » lifestyle » WOMAN brags after doing this with her neighbour’s husband to teach her a lesson. WOMAN brags after doing this with her neighbour’s husband to teach her a lesson. There’s this lady who took to social media and bragged about having it with her neighbour’s husband. She doesn’t see eye to eye with her neighbour and that’s why she wanted to revenge by sl33ping with her husband. And she was proud and happy about it.